England's Lee Westwood led the pack at Sawgrass after finishing round three on 14 under. 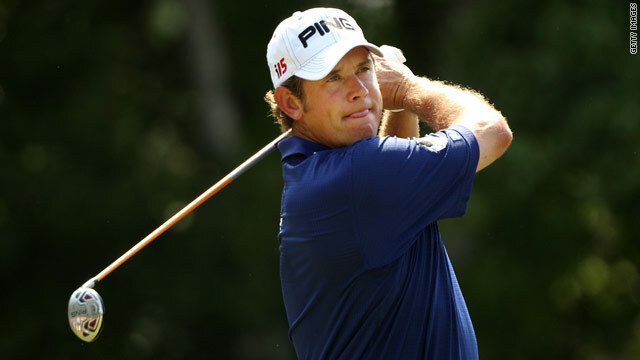 (CNN) -- Lee Westwood finished his round at the summit of the leader board on the third day of The Players Championship at Sawgrass, Florida; where he is aiming to become the first Englishman to win the American tournament. The 37-year-old -- who narrowly missed out on winning the Masters in Augusta last month -- maintained his good recent form by carding a round of 70 to finish on 14 under. Westwood birdied holes two, four, nine and sixteen to mitigate his bogeys on three and eight, and demonstrated some fine approach shots to the green to retain his advantage. Despite the up-and-downs of the day, Westwood was happy with his performance: "I gave myself a lot of chances, the golf course became harder overnight and the ground has firmed up a lot, so it was tough." He also told reporters he felt relaxed to be heading the field: "I wasn't really looking at the leader board, there's no point looking until Sunday so that didn't really bother me. "I always felt comfortable with my shots -- [so I'm} very pleased, I played ok, didn't make any putts today but I found the greens were hard and glassy, quite tricky, so you couldn't be too aggressive," Westwood said. The European front-runner also revealed how much the overall win would mean to him: "It would mean an awful lot, the greats of the games have won here. You draw a lot on your experience from coming so close at other tournaments, so hopefully I can do well tomorrow." New Zealand's Robert Allenby heads the chasing pack in second, after shooting a superb 67 to finish the day on 13 under; Italy's Francesco Molinari, and Americans Ben Crane and Lucas Glover lie in wait a further shot behind. World number one Tiger Woods showed no improvement to his stuttering form remaining ten shots off the leader after carding a 71, however, Phil Mickelson -- who is gunning to supplant Woods at the top of the global rankings -- remained in touch just five shots behind. Elsewhere, Fredrik Andersson Hed of Sweden edged towards his first European Tour victory at the Italian Open after hitting a nine-under 63 to move into a six-shot lead on Saturday. The 38-year-old Swede -- who sits on 17 under -- leads Spain's Miguel Angel Jiminez (-11) who bogeyed three of the last five holes to lose ground on the leader.